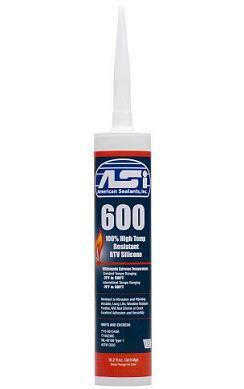 PRODUCT: ASI-600 High Temperature Silicone Sealant / Gasket Material. Suitable for intermittant to 600°F (310°C), continuous 500°F (260°C). Color: RED. 10.1 Oz Tube. Price/Tube. DESCRIPTION: ASI 600 High Temperature Red Silicone Sealant is a one-part, moisture curing, RTV (room temperature vulcanizing) silicone that cures to form a tough permanent rubber gasket which is extremely temperature resistant. ASI 600 High Temperature silicone will remain permanently flexible and provides excellent resistance to moisture aging, vibration and shock. TYPICAL USES: ASI 600 is used for sealing EPDM rubber boots to metal roof, to replace cork gaskets and is used in marine, HVAC, roofing, general construction, architectural, electrical, automotive, racing. Meets FDA and USDA Food Processing Area Requirements. Its electrically insulating, non-staining, and has outstanding UV resistance. STANDARDS: ASI 600 high temperature silicone meets the requirements of MIL-46106 Type 1 and meets FDA and USDA requirements.